Get resources to master your fear, doubt, and worry, and have the courage to go after what you truly desire instead. Each week, learn strategies to shift the way you think and live in alignment with who you really are so you can pursue that big, bold calling on your life. With this podcast, you'll discover how to pursue your dreams and ditch the conventional way of living by listening to honest conversations on self-help, mindset, spirituality, entrepreneurship and so much more. It’s real, raw, and down-to-earth. 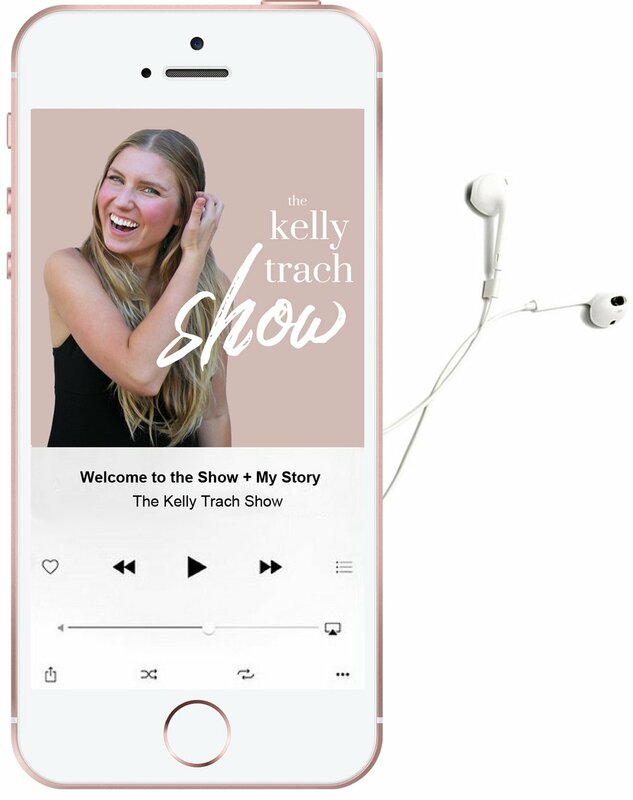 The Kelly Trach Show is a top-rated podcast that hosts high profile guests from around the globe. So, subscribe and discover what thousands of people are loving and tuning into on the daily. Teachable: Get 3 free classes ($1K value) on how to create your first online course when you sign up here. Four Sigmatic: Save 15% with the code "kellytrach" on any order anytime. Bench Bookkeeping: Sign up here to get 1 free month of bookkeeping + 20% off your first 6 months. Podigy: Get 50% off your first month of podcast editing when you mention The Kelly Trach Show. Convert Kit: Email software that helps you sell more stuff. Get a free 30-day free trial here. If you’re ready to do what you really, really want with your life, then listen in. 7 tried and true strategies for you to rock right now. Zan Farrow on Trusting your Intuition, Going all in on Your Dreams & What it’s Like Working with Me! Got your eyes on the prize? Let’s make it happen. Today, I’m in the hot seat answering Kristy’s burning questions! Ready to do that big bold thing? Listen to this. It’s the most honest and real and raw show yet to date. OMG here we go. Is it a voice? Is it a person? Is it me? What if You Let it Be Easy? In 6 months, you can be in a whole new financial reality. Radical honesty, here we go! You asked and I’m filling you in on the juicy details. Don’t demonize quitting. Celebrate it. Here’s why quitting is the best thing ever. Sometimes, it’s the only way to get the right answer and arrive at your truth. This is the hidden barrier preventing you from getting to the next level. "How would it feel to allow it in the way it's meant to happen?" This is all about letting things magically come to you by leaning into your yin energy. You’ll bloom when it’s time. I promise. Unearth your divine talents & own them. "Knowing how to restore and having tools to bring us back to our truth allows us to be human & connect." 8 Implementable tips to find your people & handcraft your community. Law of attraction, crystals, quantum physics – today we are going there. If you feel like life isn't working in your favor right now, listen to this. "Trust is being able to trust in the feeling and inner knowing rather than needing proof or evidence to show you that it's going to happen." Wanna make the big leap? Tune in. A love note reminding you to stop dimming your light. Are you listening? Or are you shoving it away in the top shelf of your linen closet hoping that it will go away? Here's the nitty gritty on blasting through your money blocks. "You have to slow down enough to hear that your intuition is there with you." Is Your Competitiveness Rooted in Scarcity? If you feel like you need to compete, you've already lost. We're talking about allowing and trusting versus forcing and controlling. "The harder I try to be someone else, the harder the journey is." The real-life change actually looks like tiny, tiny shifts versus burning it all down to the ground. "It's really about taking care of yourself so that you can show up fully for yourself and others." Rest is highly underrated, but it's where the magic happens. These three words illustrate where you're keeping yourself stuck. When you need to set a boundary statement, use this one. Works. Every. Time. "Being more open and honest with other people starts with being more open and honest with yourself." This is what's actually required to go from point A to point B. Three little things to master your mind, move through your fear & blast through your blocks. Starting a business or creative endeavor? Try working in a whole new way. Take a feelings-based, intuitive, heart-centered approach to goals. And, pretty much forget the rest. "We are conditioned as humans to think that when we face negative things, we must fear it or fight it." What If You Told People How You Were Actually Feeling? Is the generic "I'm good, I'm great, everything is amazing" false? "You have the answers you need, even if you don't realize it yet." Knowing when to stop looking for YouTube DIYs and instead, committing to professional help. Is Complaining Blocking Your Healing? It's easy to focus on what you don't want, but by doing so, you perpetuate the discomfort. These two things are actually drastically different. If you are having troubles getting diagnosed, try these strategies. Learn how to make grounded, heart-centered choices when you feel stuck between two options. If "goal setting" makes you want to turn around and run, this episode is for you.